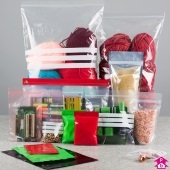 All-purpose packing bags are used to protect items in storage or transit, pack or display food and groceries, line boxes and much more. Huge range of polythene rolls, protective plastic sheeting and polythene film for wrapping awkward items, plus heat sealers to seal the deal. Widest range of clear and coloured carrier bags to suit your product, including vest, premium and patch handle styles in standard polythene and eco-friendly materials. Air-cushioned polythene bubble packaging used to protect fragile or delicate items in storage or transit. Includes bubble wrap, bubble bags, padded mailers and loose void fill. Deisgn your own packaging, including bespoke printed carriers and printed mailers to give your company that professional touch. Crystal clear retail display bags manufactured from high clarity polypropylene film are ideal for retailers to give their products some added sparkle. Lightweight polythene garment and laundry film to protect clothes in storage or transit. 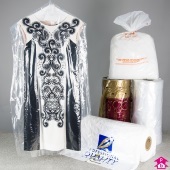 Popular with dry cleaners, this range includes clear and pre-printed garment covers on the roll and laundry bags. 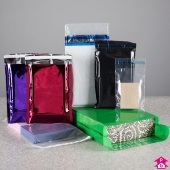 Made with a simple grip seal for easy opening and closing, grip seal bags are the perfect way to secure bag contents and prevent leakage and contamination. Light, waterproof and strong, polythene mailing bags are the perfect mailing solution for regular post or courier transport. 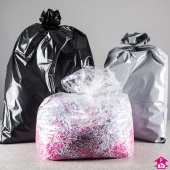 Huge range of black sacks, bin liners and other waste bags, all made from strong recycled polythene, and ideal for any waste disposal in the home, garden or workplace. Huge range of eco-friendly packaging from bin liners to dog poo bags to get the job done whilst doing your bit for the enviornment. 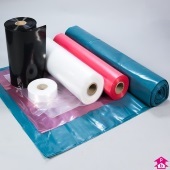 Polybags.ie is a division of Polybags.co.uk - the UK's largest polythene packaging manufacturer. This website was designed to provide Irish customers with a fantastic choice of polythene packaging, whilst offering Irish business customers an extra 23% saving when shopping from us with 0% VAT. A range of crystal clear presentation and retail bags manufactured from high clarity polypropylene film, ideal for retailers wanting to really show off their products! 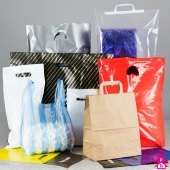 Plain polythene bags, which clearly display the contents of the bag, can be produced to any specification. A popular choice for mailing bags, which can be printed all over with a clear window. Grip seal bags are closed at the top by squeezing the inter-locking seal together, while slider grip bags use a zip slider to fasten. Ideal to use when you want to secure bag contents and avoid leakage or contamination, with no need for ties, clips, staples or tape to seal the bag. 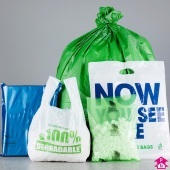 Polythene waste bags and sacks are used to dispose of a wide range of domestic, garden and workplace waste. Whether recycling, composting or disposing in landfill, collect your waste in the relevant waste sack for quick, easy and hygienic disposal. 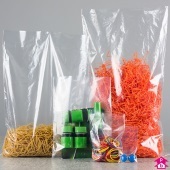 A huge variety of clear and coloured stocked carriers allow retailers to find the perfect carrier bag to suit their specific product, catering for everything from CDs to clothes and books to paintings. 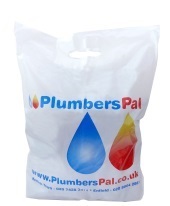 Polybags also provides tailor-made carrier bags complete with very own company logo or design. Tubing and sheeting are an excellent packaging alternative when wrapping or packing multiple items that share a common width or diameter but vary in length. Once wrapped around your product, poly sheeting can be sealed with tape, clips, ties or using a heat sealer. Bubble film and bubble bags have proved to be one of the most versatile packaging materials of recent years. Soft and flexible, yet displaying incredible tear resistance and fantastic protection for contents, bubble film has earned itself a place in almost every packaging environment. 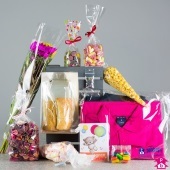 Polybags manufacture and stock a wide range of eco-friendly packaging products to suit every kind of packaging need. A huge range of biodegradable and compostable products will get the job done whilst helping do your bit towards a better, greener environment. Garment covers are thin polythene film sleeves, popular with dry cleaners, tailors and hotels, that protect clothes from dust, dirt or moisture in transit or storage. Laundry bags are also a popular product and come in plain or pre-printed polythene for convenient clothes collection. Polybags is a leading UK manufacturer and stockist of shrinkable pallet covers for outside and in-transit protection. Available in cost-effective tear-off rolls for large volume supply, or boxed loose for smaller volume users. However specialist your job or task, there is a polythene product out there for you. Polybags are specialists in specialist bags, stocking everything from film-front display bags to super-strong Polymax bags, along with range of specialist waste sacks for safe disposal waste including asbestos and clinical waste. Polybags stock a range of packing bags and associated packaging products for transit packing, such as stretch-wrap, tape, boxes, pallet covers and document-enclosed envelopes. All in stock for next day delivery if required. Designed for postal or courier transport, mailing bags are light, waterproof and have an integral adhesive strip. Polybags' stocked ranges include economy and 'Tuff' mailers, mailorder and courier bags, tamper proof, bubble and even high-impact metallic mailers.